Famous for its snow laden mountain peaks, various opportunities for adventures, gleaming lakes, lush meadows and many such epitomes of nature's opulence, Kashmir is a place for every tourist. It is an enticing fact that this paradise on earth and is also a great place to enjoy fishing and angling. The shimmering water bodies of Kashmir Valley boast an intriguing assortment of fish species. The salubrious climate of the region suits the aquatic life here. For this reason and intent, fishing enthusiasts from all over the blue planet swarm at this region to savour the excitement of angling in radiant streams and lakes found in this fascinating area. One can find the trout fish in all the Nallahs and streams of Kashmir Valley. However, the major water bodies boasting remarkable amount of trout are Wangath, Lidder, Nowbugh, Ferozpur, Gurez, Lam, Hamal, Sukhnag, Sindh, Kishenganga, Erin, Doodhganga, Bringi, Hirpora, Aharbal, Kokernag, Madhumati, Naristan, and Dachigam. Department of Fisheries has divided these streams into numerous trout beats. 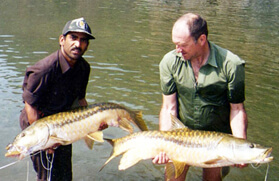 Fishing is counted among the major attractions in Kashmir. April to October is considered as the best time for angling here. 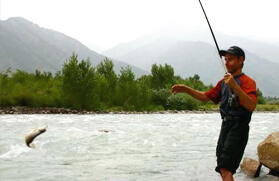 With a universal appeal, fishing in Kashmir can be best done in its Pahalgam region. 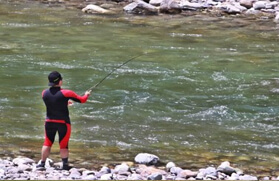 Without a second thought, Lidder Valley in Pahalgam is a dreamland for an angler. With 05 Nights and 06 Days of carrying out comprehensive and congenial angling tour to Kashmir, the fishing enthusiasts can quench their thirst of enjoying the recreational activity of fishing like never before. Starting from traversing through the various tourist attractions frittered on the land of Srinagar, the tour will take you to the meandering lakes in Lidder Valley, Lower Lidder Valley, Sindh Valley, Lower Sindh Valley and Dal Lake. With a tour guaranteeing a delightful experience of angling in Kashmir, there is all what you dream for as a fishing buff. On arrival at Srinagar airport, meet our representative who will be there for your welcome and thereafter to transfer you to already booked Deluxe Houseboat. Check in at houseboat and thereafter leave for an afternoon tour. In our afternoon tour, we will be visiting the most popular Mughal Gardens (Shalimar and Nishat). After exploring these gardens, we will return back to the houseboat. On the way, we will be visiting Kashmir Carpet Weaving and Handicrafts centre where you can buy things for your loved ones. Enjoy an overnight stay at the houseboat. Shalimar Garden is a beautiful Mughal garden in India and one of the major attractions of Srinagar. It is linked through a channel to the northeast of Dal Lake. The garden was built in 1619 by Mughal Emperor Jahangir for his wife Nur Jahan. It is the largest Mughal garden in the Kashmir Valley and now serves as a public park. Nishat Garden is a terraced Mughal garden lies on the eastern side of the Dal Lake. It is the second largest Mughal garden in the Kashmir Valley and one of the major tourist destinations of Kashmir. 'Nishat Bagh' is an Urdu word that means "Garden of Gladness", "Garden of Joy," and "Garden of Delight. In the Morning after breakfast, we will leave for a full day trout fishing in upper Lidder valley in Pahalgam. 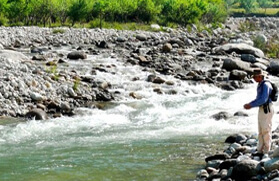 Spend your entire day in fishing in this one of the favourable fishing destinations in Kashmir. Thereafter, enjoy an overnight stay in the hotel at Pahalgam. 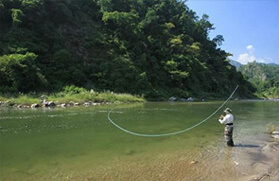 Today, we will go for full day trout fishing in lower Lidder valley and try our lucky to achieve success in our mission. Afterwards, in the evening return back to Srinagar and enjoy delicious dinner followed by an overnight stay in Super Deluxe Houseboat. After breakfast in the morning, we will leave for full day trout fishing in upper Sindh valley. Here, you can have an ultimate fishing experience. Thereafter, enjoy an overnight stay in the hotel/tented camp at Sonamarg as per the option chosen by you. In the morning after breakfast, we will leave from hotel full day trout fishing in lower Sindh valley. After enjoying a full day trout fishing in lower Sindh valley, we will return back to Srinagar in the evening and take pleasure of a comfortable overnight stay in Super Deluxe Houseboat. On the last day of our tour, we will go for Shikara ride on Dal Lake after breakfast in the morning. Thereafter, our representative will transfer you to Srinagar airport to board the flight for onward destination.